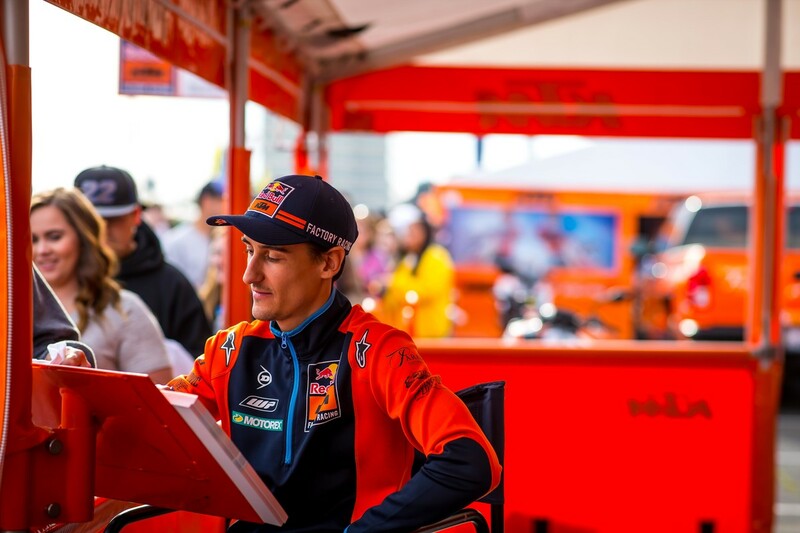 Due to an offseason knee injury, Red Bull / KTM’s Marvin Musquin was forced to play a game of catch-up to start the 2019 Monster Energy Supercross season, but the #25 looked all caught up at round four. After crashing while running 2nd behind Cooper Webb at the halfway mark of the Oakland SX main event, Marv was sent back to 4th behind series favorites Ken Roczen and Eli Tomac. It looked like he had thrown away any chance at a win and his second podium finish in a row, but Marv had no interest in accepting that fate. Marvin mounted a late race charge and that pace quickly took him back around back around the #3, the #94 and erased the eight-second lead the #2 had built up—finishing less than a second behind Webb at the finish. While Marvin has not scored his first main event win of 2019, his dramatic improvements over the first four rounds and his come from behind charge in Oakland was huge for his mental game. The Frenchman is now heading to San Diego with zero doubts that he is back on pace. With a head full of confidence and being only four points behind the series leader, Webb, the #25 is in a good place heading to round five. After the podium celebrations and press conference was over in Oakland, I caught up with the #25 to talk about his race in Oakland. Marvin (25) had closed in to make it this close to Webb (2) at the finish. Marvin, 2nd tonight. Hard to be mad at that, but how did you feel about your day/? It looked like Coop would get a little distance then you would reel it back in. I knew…It’s a long main event—20-minutes. If you’re following the leader but you can’t really pass him, you want to stay there and push towards the end of the moto. Unfortunately I relaxed a little too much before the whoops and I lost the front end in that left turn. From that I thought I was done. I mean done! I gotta admit, I thought you were done to. Especially when you dropped all the way back to 7th behind Kenny [Roczen] and Eli [Tomac]. Done for the podium at least. I was back and then Tomac got me and I got him back. 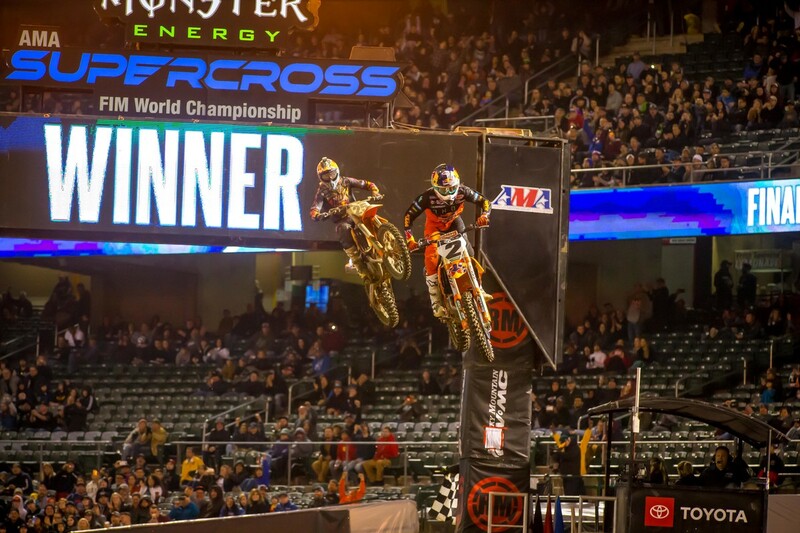 To be able to pass Tomac back, pull away, pass Kenny and pull away, it was great. It showed the speed and intensity that I had. To pass the [points] leader after a crash like that, I’m proud of myself right now obviously, but when I crossed the finish I was very bummed. For sure I maybe I could have won, but I gotta be happy with that. Love Marvin or hate him, you can always find him staying the longest to sign autographs for fans and doing interviews with the media. The man in the consummate professional in every sense of the word. You talked about how everyone was doing the same things for the most part on this track but still you were able to chop off big chunks of time quickly in the end on Cooper. Where did you think you were making that time up? A little bit everywhere? Yeah, I think a little bit everywhere. I think over by the mechanics area—that little jump right after. I think I was a little bit better. I want to say thanks to DV [trainer David Vuillemin]. We work good on lines, bike positions and stuff like that. I’ve been enjoying it even though it’s never easy, When you get to the main, those whoops are ruined. When you see some riders killing in practice and struggling in the main, it shows you how different it gets. Has Cooper surprised you at all so far? You’ve been training with him this offseason so I know you know how he’s been doing at the test track, but he’s surprised most people. Cooper definitely had a good offseason. He put in some good work No excuses, but that’s the way it was. He got a great start. When you see Phoenix; he didn’t get a great start and he got 10th. The level right now is super tough. You never know who’s going to be on the podium. Starts are important. But yeah, he did really good once again today. He was able to be leading right away and he wasn’t eating dirt in that sand section. I fought hard and it was a good race. While you haven’t gotten a win yet, you’re only two points away from the red plate your teammate has now. You gotta feel like you’re in a good spot? Yeah, of course. I don’t really look at the Championship to be honest. Obviously I hear people saying it so I cannot not know, but I’ve never been in that position to be so close to the leader in the Championship. So I guess that’s a positive. I’m doing a lot better with the knee and I’m able to practice hard during the week. It can only get better from here.